On Saturday July 16th, Adrenaline Cycling hosted the Adrenaline Twilight Grand Prix. This was an unusual race for Southern California as it was hosted at 8pm on Saturday night around the Qualcomm Stadium parking lot. The race course was challenging with a nice hard hill on it, as well as a 180 degree hairpin off a slight downhill. The Pro 1/2 field started off the race with around 50 riders on the start line. From the gun there were a number of attacks going off the front of the group and with $50 primes on some laps it would make the racing very aggressive. The SoCalCycling.com Team had 3 riders represented with Rigo Cabrera, Jason Cianfroccca and myself. We had a plan and that was to have one of us to be in the winning break of the day. Twenty minutes in I put in a solid counter attack on the hill and spent a full lap off the front of the group. Shortly after another two riders bridged up to me. We quickly got into a solid rhythm and were working really well together. The three of us spent around 40 minutes ahead of the group that was between 15 and 25seconds back the whole time. Tyler Locke (Centric Race Team) & Diego Sandoval (Cylance-Cannondale-Incycle) were pulling really hard behind us trying to bring it back together. About an hour in, a group of 6 riders came across to the main break of 3. The group kept the pace up with few attacks until 5 laps to go. Diego put in some solid attacks on the hill a few times but nothing was to stick. The group came down to a sprint with Diego Sandoval (Cylance-Cannondale-Incycle) taking the win ahead of Roger Ainslie (SDBC) in 2nd and myself taking out the podium for 3rd. 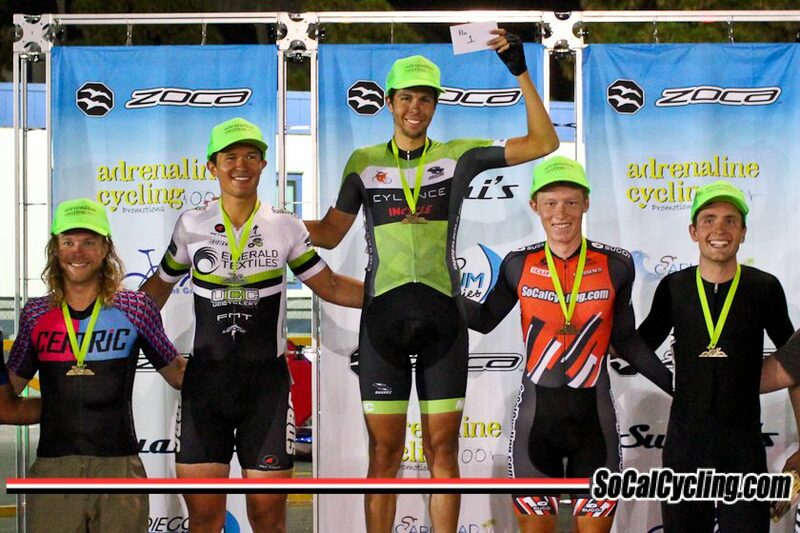 Thanks to my teammates Jason and Rigo for their help for another podium for our team as well as a big thanks to all our SoCalCycling.com Team Sponsors – SoCalCycling.com, Cannondale, SUGOI Performance Apparel, Full Speed Ahead, Clif Bar, ROL Wheels, KMC Chain, TRP Brakes, Larsen’s Restaurants, Fabric, Julbo USA, Ontario Police Officers’ Association, Continental Tires, Incycle Bicycles.